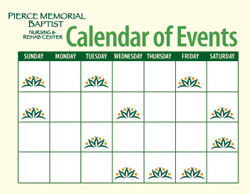 Pierce Memorial Baptist Nursing & Rehabilitation Center guests and family members can relax in comfortable common areas, take in our beautiful outside spaces or enjoy a meal together. The lounge area includes computer stations to stay connected to family and friends through email and Skype with assistance. Outdoors, relax on our patio or enjoy a casual stroll on the Creamery Brook walking trail. At PierceCare, you’ll appreciate our attention to every detail with many on-site conveniences including a library, beauty salon and weekly worship services in our chapel.